The new year is already moving quicker than it has any right to, which is to say we’re well on our way to the first page off the 2019 calendar. With that transition comes a fresh batch of film and television titles on their way to the Starz library, which we’ve outlined for you below. The highlights of Starz’s February slate fall mostly on the movies side, where the pay-cable channel is adding two of the best zombie movies ever made to its streaming library starting on Feb. 1. 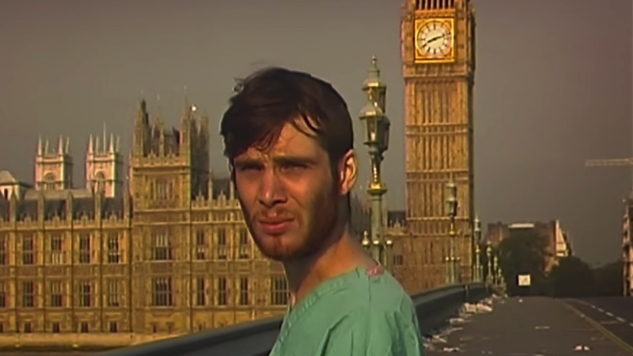 Those include Danny Boyle’s 28 Days Later, the nerve-shredding 2002 thriller starring Cillian Murphy as a lone survivor struggling to survive in a zombie-apocalyptic London, and Edgar Wright’s 2004 horror-comedy Shaun Of The Dead, the first in his Cornetto Trilogy, which saw Simon Pegg, Nick Frost and friends team up to take on zombies from the comfort of their neighborhood tavern. Arriving alongside that dynamic duo on the first of the month are titles like Alfonso Cuarón’s stellar Children of Men adaptation, Steven Soderbergh’s Julia Roberts-starring Oscar winner Erin Brockovich, Tim Burton’s stop-motion passion project Frankenweenie, 2003 rom-com classic Love Actually, Oscar-winning Ray Charles biopic Ray, Patrick Swayze-starring beat-’em-up Road House, Cameron Crowe’s 1989 romantic dramedy Say Anything… and late-’70s Burt Reynolds/Sally Field classic Smokey And The Bandit. Films to follow later in the month include Disney-Pixar Oscar winner Brave (Feb. 2), acclaimed animated Rapunzel reimagining Tangled (Feb. 2), Alexander Payne’s Jack Nicholson-starring dramedy About Schmidt (Feb. 3), George Miller’s original 1979 Mad Max (Feb. 8), John Hughes/John Candy comedy Uncle Buck (Feb. 8), a pair of Pixar sequels in Cars 2 and Toy Story 3 (Feb. 9), Joe Wright’s Oscar-winning Atonement adaptation (Feb. 16), 2012 animated franchise first Wreck-It Ralph (Feb. 16) and 2018 horror flop Slender Man (Feb. 23), among others. The pickings are decidedly slimmer in TV, though Starz is adding several new episodes of an acclaimed original series, as well as of a handful of noteworthy licensed shows sure to invoke some serious ‘80s nostalgia. Debuting on Feb. 1 are episodes of animated Dr. Seuss family series The Cat In The Hat Knows A Lot About That! (eps. 211-308), ‘80s superhero cartoon He-Man And The Masters Of The Universe (eps. 138-138, 141, 258-265), South Florida-set cop classic Miami Vice (eps. 401-413), Colombian comedy Polvo Carnavalero (eps. 101-138) and He-Man spinoff She-Ra: Princess of Power (eps 150, 153-156). Following later in the month are episodes of David Hasselhoff-starring cop/car team-up Knight Rider (ep. 411-413) (Feb. 8), suspense thriller Rig 45 (eps. 101-106) (Feb. 22), mech-battling ‘80s animated series Voltron: Defender of the Universe (eps. 101-114, 131-132) (Feb. 22) and Golden Globe-nominated 1965 Western The Big Valley (eps. 201-218). We’ve saved the best for last: J.K. Simmons-starring Starz original series Counterpart, which we at Paste have called “one of the most complicated and beautiful spy shows on TV,” continues its second season in February, with episodes 208, 209 and 210 airing on Feb. 3, 10 and 17, respectively. While you’re here, be sure to take note of what Starz is losing in the month to come, as well: 2017 supernatural-action sequel Underworld: Blood Wars (Feb. 8), George Clooney starrer The American (Feb. 15), acclaimed family-dramedy Captain Fantastic (Feb. 25) and horror franchise finale Resident Evil: The Final Chapter (Feb. 27) all depart the Starz streaming library next month. Most of February’s losses fall on Feb. 28, though, including cop action-comedy Bad Boys, Ang Lee’s Oscar-winning martial-arts jaw-dropper Crouching Tiger, Hidden Dragon, iconic Tim Burton drama Edward Scissorhands, Steven Spielberg’s iffy Peter Pan adventure Hook, 1969’s original, Michael Caine-starring The Italian Job, essential Mike Judge-directed workplace comedy Office Space, Joe Dante’s millennial-beloved action-comedy Small Soldiers and 2001’s all-timer of a comedy Wet Hot American Summer. Take stock of everything coming to and leaving Starz in February below.